I've been looking for new camera software and the recent test was done with xeoma which isn't open source softwar,e but it also is not that expensive compared to many other solutions especially when you want to have your recorder something that you can easily upgrade and maybe even have it done something else as well than just surveillance monitoring. Usually though surveillance monitoring is so heavy that device that records doesn't do much more than just record. Xeoma has webpages at http://felenasoft.com/xeoma/en/ where one can find all the needed information and download the software itself. Xeoma works on Windows, Linux, Max OS and even on Android. For my personal use Linux is the one that is most important, however I don't exclude windows really as it would be good for remote access possibilities. Why? Because the cameras will not be monitored by me but e.g. my parents who are quite tight to Windows world. :) The version used in this quick review was 14.7.18 64-bit for both Linux and Windows also should be noted that I used the Trial period version during this initial review. 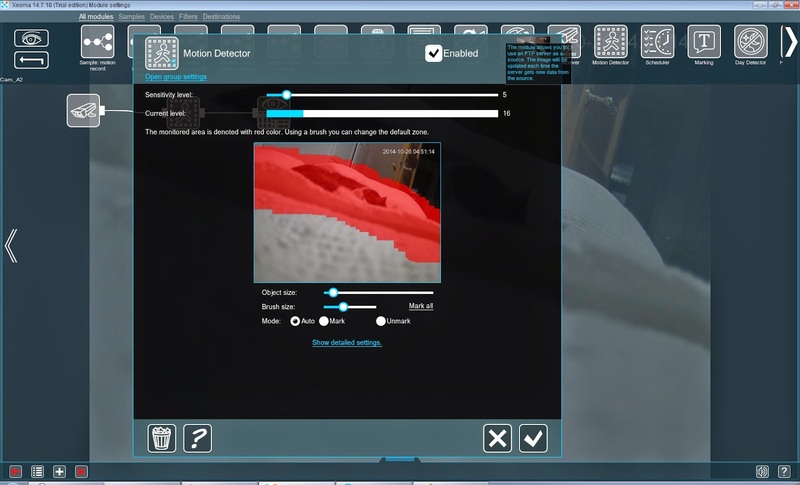 First time I started xeoma for testing, it was very nice surprise to see that Xeoma could find local webcam and also my IP cameras (on Windows) that were on same IP subnet with the computer I started the application with. It didn't however find automatically the cameras that were on my other subnet in my local network, but that is understandable. The cameras that were found automatically were running default settings and did not have restricted access, which probably helped quite a bit. This initial device search made it very easy to check the configurations and start testing some of the features especially as for me it showed more than one camera. 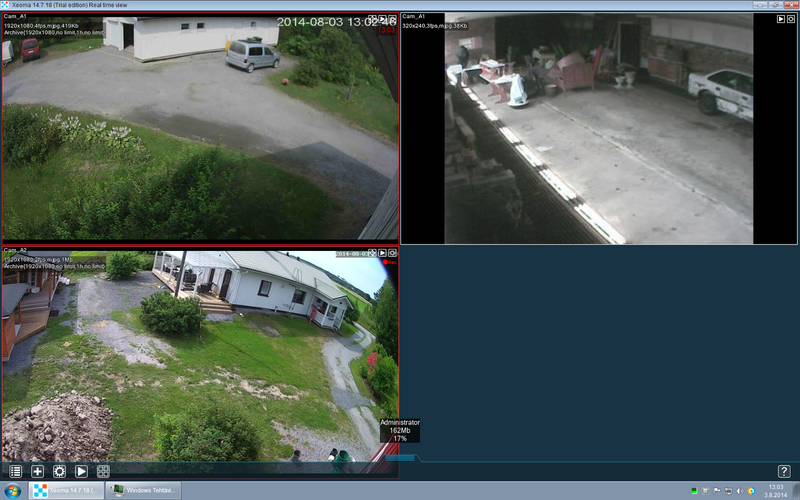 Here is a sample photo with some cameras showing in the xeoma monitoring screen. I must admit that the User interface feels a bit confusing at first and there are some problems with it as well, but once you get used to it it is usable. For example I could not use "tab key" on keyboard from going from one field to another which I have used to do a lot, but that is not a blocker just a minor annoyance. Also when typing the camera settings when typing faster the info row was not updating properly. Anyway these are just something that you have to handle only when you setup the cameras. After you have setup everything and have all the recording and cameras etc. done properly there is not really anything to do anymore and then the simplicity of the UI kicks in when monitoring the cameras. By default the cameras added to Xeoma have very simple default module chain that has the actual camera, scheduling, motion detect and previewing and archive modules enabled. This is quite nice combination for many, however for my use I removed the schedule as the first things what I did just to make the chain simpler and because I want to have cameras always on recording mode. For my use motion detection is the main thing that I need which has been made quite easy in xeoma. Also the default chain contains automatically the motion detection as said above, so it was easy to configure from the start. I started xeoma on Windows machine, entered the details of my linux machine and there it was instantly viewing of the content from my Linux machine on Windows machine, so simple! Almost love at the first sight ;) On Xeoma client application side to go through following flow "Main Menu > Remote access > Connect to" and there entered IP address kept the port the same 8090 and added the password from the Linux command line. Of course this assumes that you dont have firewalls or have made rules for the 8090 port on the Linux machine.